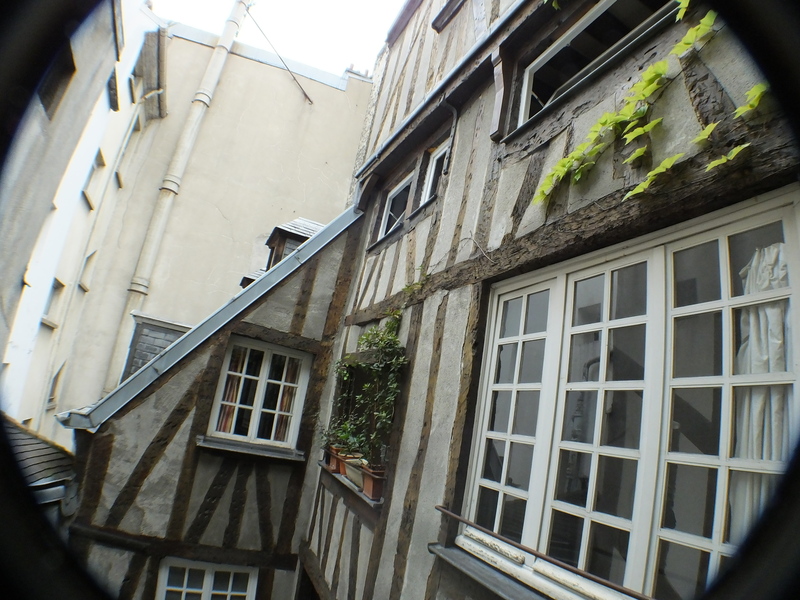 We have arrived in Paris, and all is well: a good travel day, only ten minutes at Customs which was a great improvement over the forty-five minutes last year, and a welcome home to our favorite apartment on rue St. Paul. Our neighbors heard us as we came up the steps and came down to say Bonjour. Such fun to be greeted warmly! 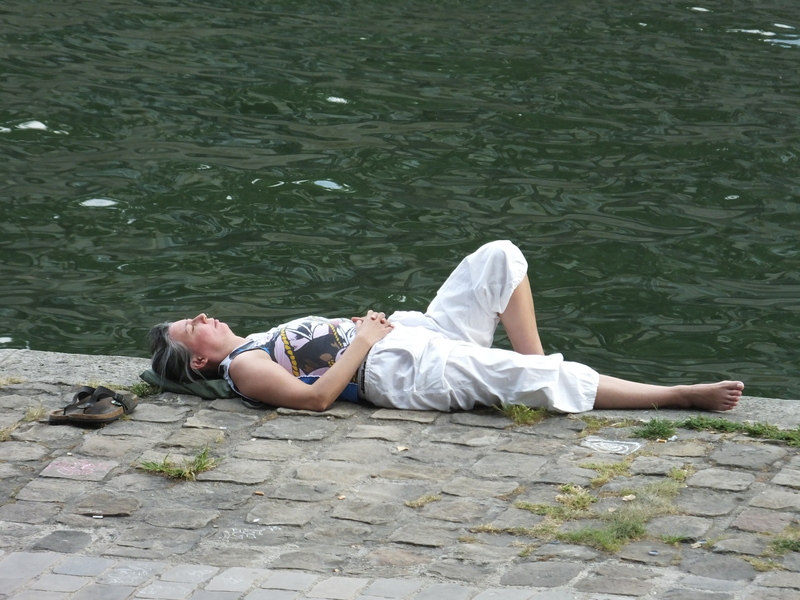 The weather is hot by Paris standards and expected to be in the low 90’s tomorrow! Think no air-conditioning, and this becomes a significant event. We do have two fans for upstairs and down which makes an amazing difference. 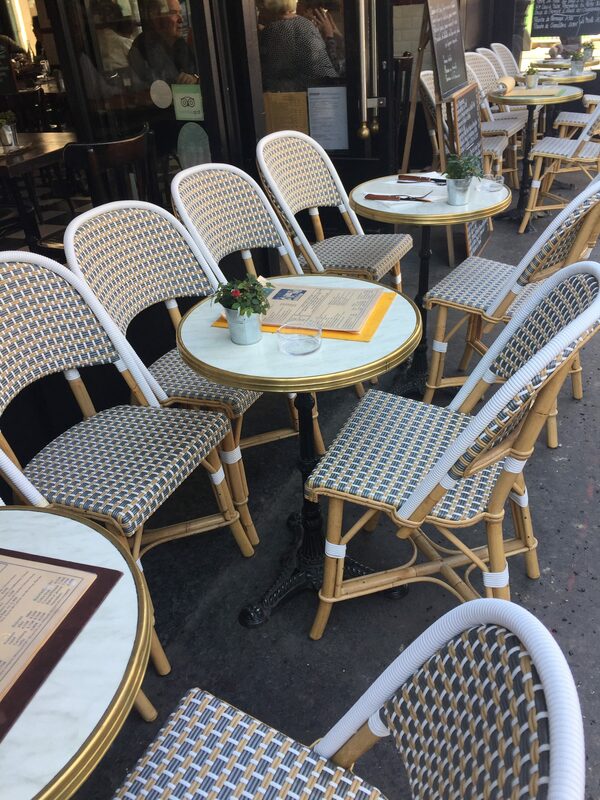 We simply acclimate to whatever presents itself which is part of the audacious Parisian spirit! Yesterday after unpacking, we bought our first round of groceries, recharged our subway passes, bought new place mats for the table, and I did my usual fussing with the apartment to get it livable by our expectations. We both slept VERY well last night which is a good start on the way to resetting our internal clocks. What’s new? We have new owners AGAIN at the beloved little café beneath us, and they have new chairs reminiscent of last year. We boldly introduced ourselves as frequent customers. I think they thought us a little strange, but that will dissipate as we become acquainted with them. Also, we will have to tolerate construction during the visit as they are putting in new underground cables in our immediate area. This is happening all over Paris so it’s our turn to endure the noise and inconvenience. Though fully exhausted, we made our usual after-dinner walk along the river which produced a couple of interesting photos. The last is our “Purely Paris” shot of the day. Hope you enjoy and more to come as today will put us on a more regular schedule. 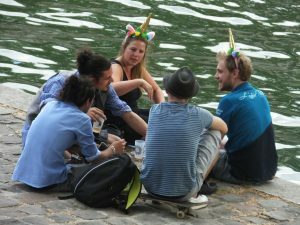 “Purely Paris” photo of the day – Party along the river! We’re so glad you are there and feeling good. Please be safe and keep alert, as I know you will. We were so proud and grateful for the French president’s comments last night. Glad to know you made it safely. Enjoy! Oh I love those windows! Glad you’re “home” and settling in. 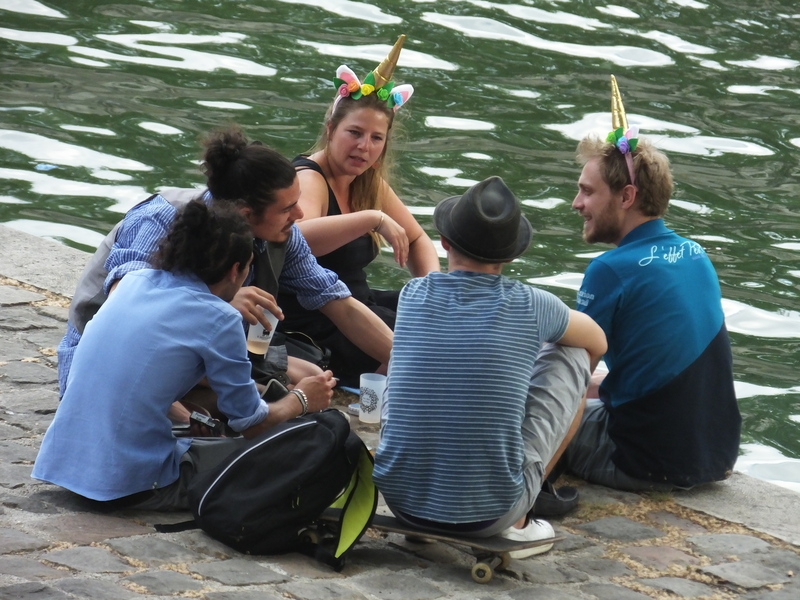 Perhaps the party by the river was for the unicorns I see there. Hope/know it’s the first of many happy days. Glad you made it and you’ve taken photos of real Parisian people! Bernie, I presume you received my last response to our text….you can add french to your ‘languages’ on your phone which makes it much easier if you wish to text in franglais. You should be able to get into some political demonstrations soon, so I hope you will take pictures of your fellow activists. And NO BACKPACKS! Linda did not acknowledge my suggestion for Bastille Day, as if she was just too busy because you were headed to the airport (il n’y a pas de souci) but if you did NOT receive the post about the concert at the Champs de Mars, between the Eiffel Tower and Ecole Militaire, let me know I’ll be happy to resend. Be careful, Have Fun!, and remember you are old people now. Old is only a state of mind! Delighted to hear you have arrived safely and already living the life! 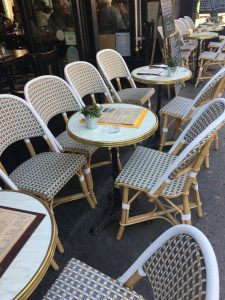 So glad you are there and settling into your Parisian routine, though i am sorry about the heat! I see that short shorts have made their way to Paris. I wonder what else will be new this season. So happy your travels were safe and easy going through Customs. I love these posts and look forward to your next one! So are we! Bring a variety of clothes to accommodate any kind of weather. It can turn on a dime. Last year this time, we nearly froze to death.